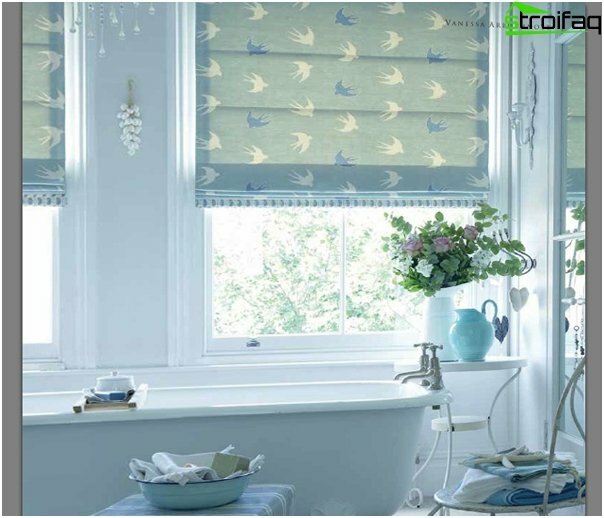 Roman blinds (also known as Rolling) Appeared a few thousand years ago, but theynot only lost its relevance, but also confidently holds the leading position in the textile market. 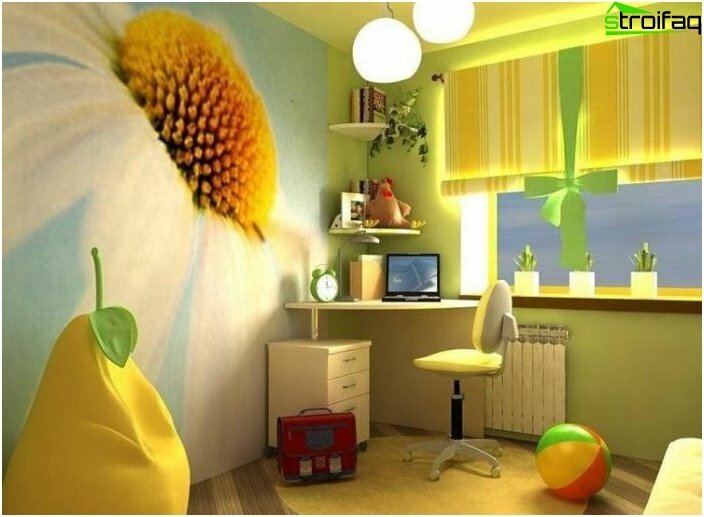 All brilliant - easy! 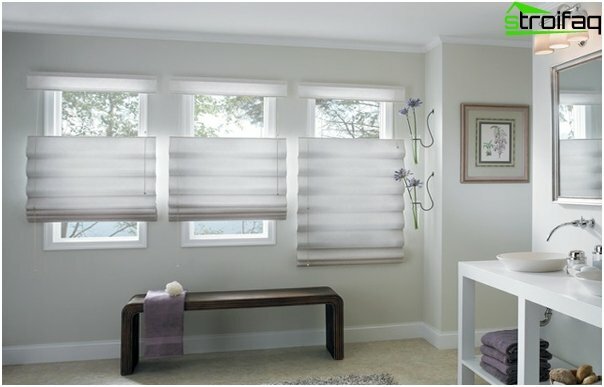 This is the golden rule of one hundred percent corresponds to the Roman blinds. 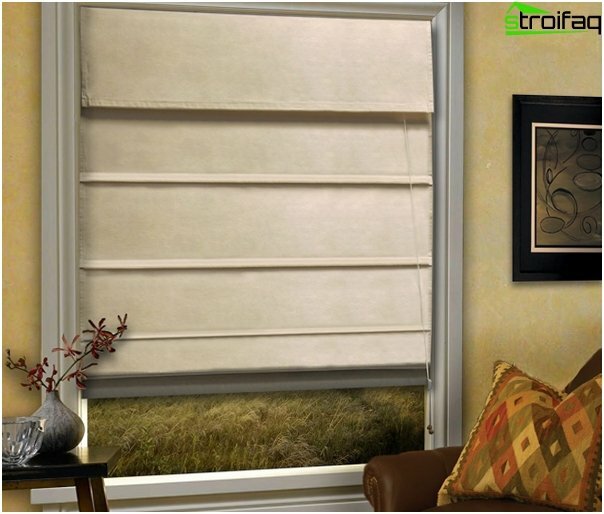 Roman blinds are rectangular(At least - square), smooth fabric, which are mounted on the cornice. 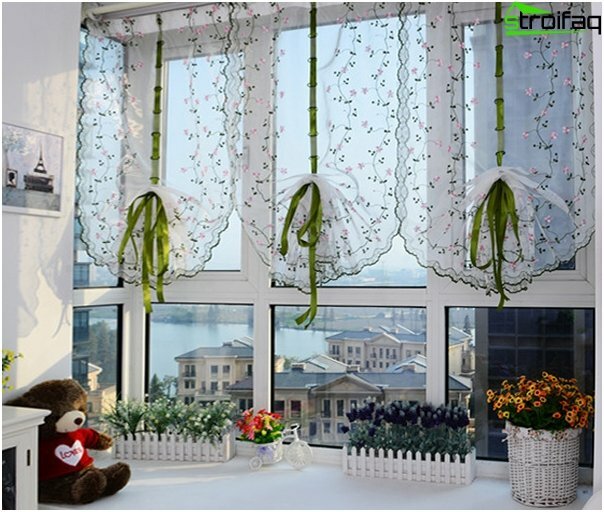 Along the eaves in the fabric evenly distributed frame rods, through which, with the help of special lace or chains, regulated height curtains. 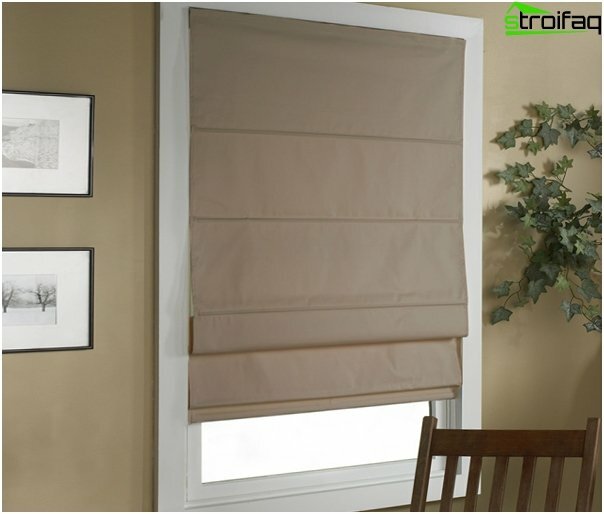 This is the basic principle of operation of the blind, which can be upgraded in its sole discretion. 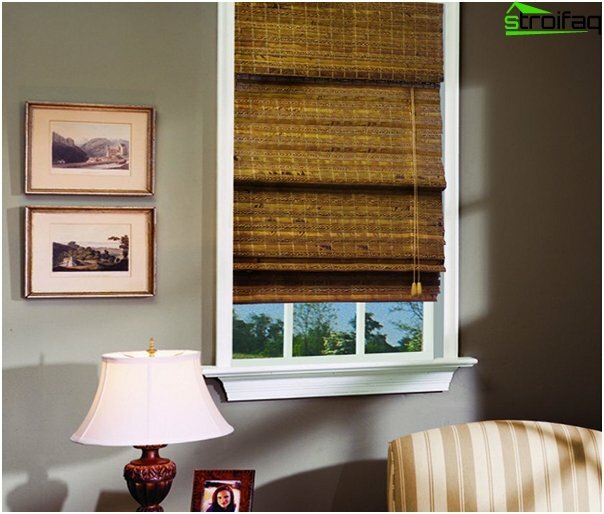 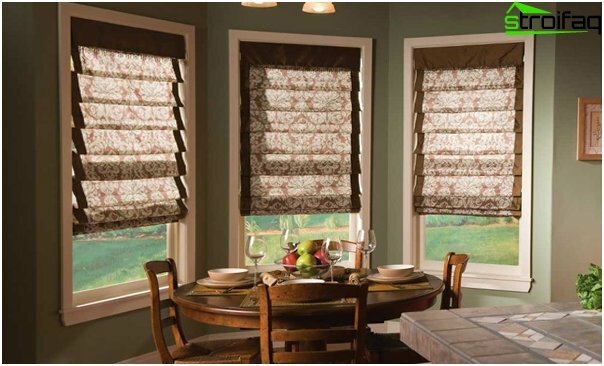 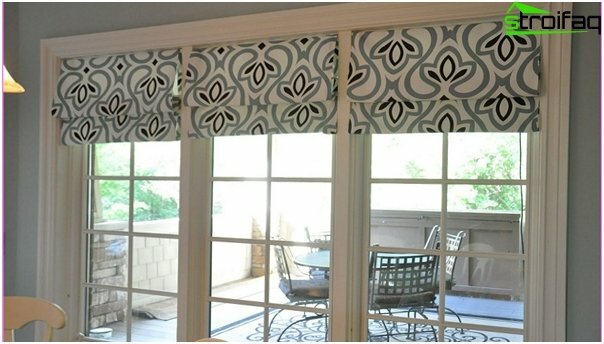 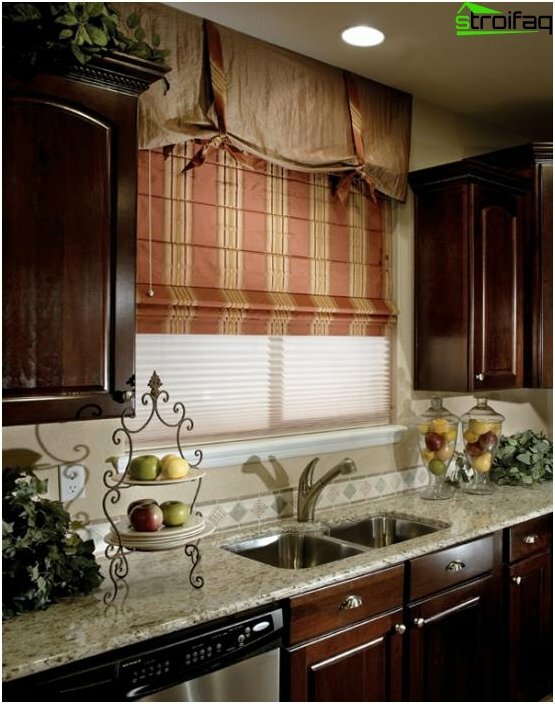 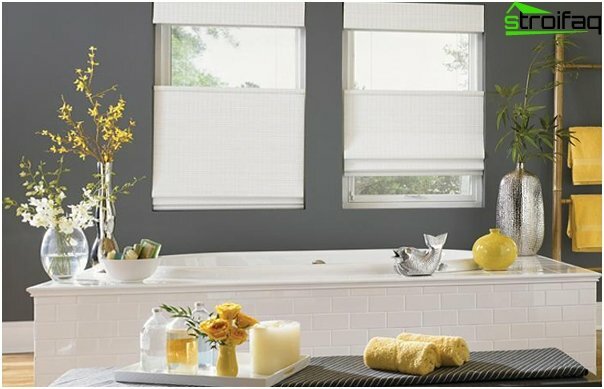 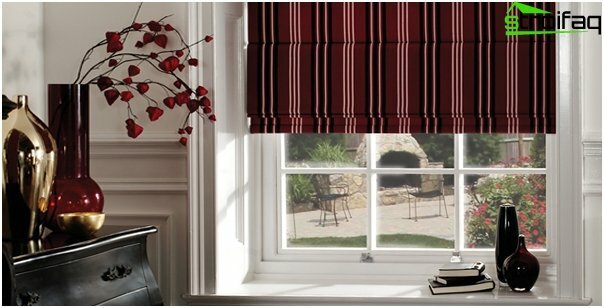 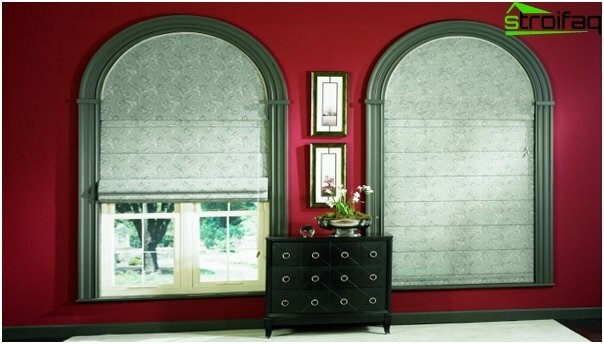 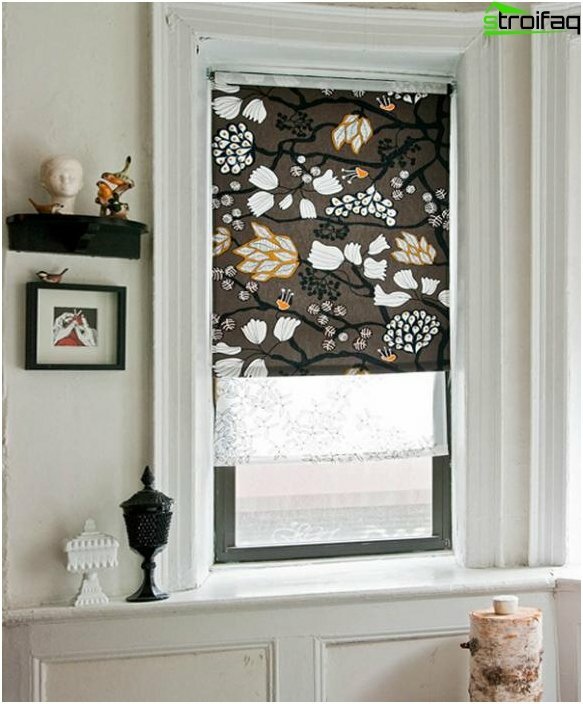 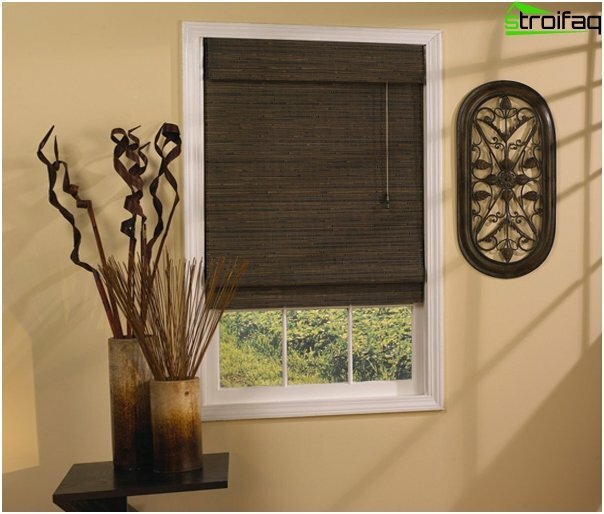 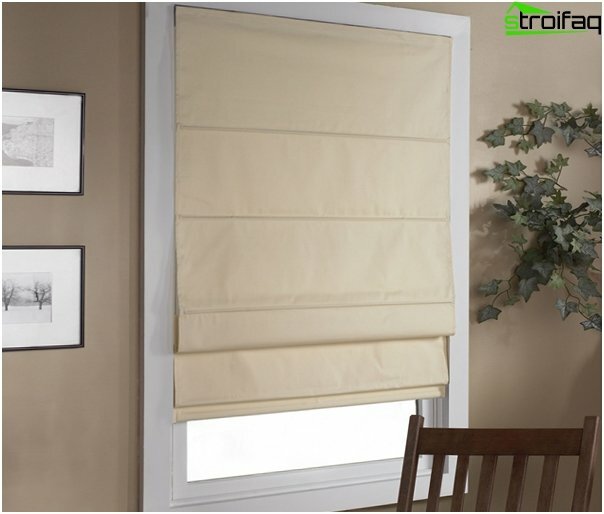 Let us examine the features of the most common varieties of Roman blinds. 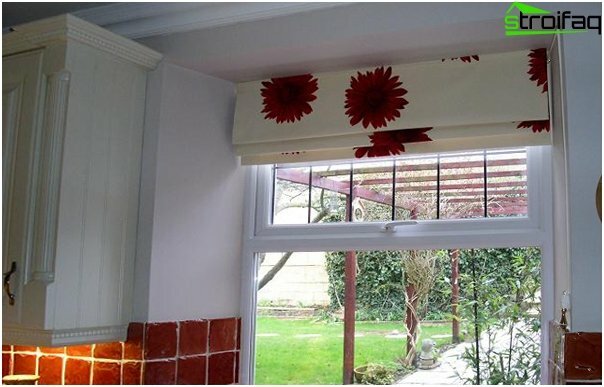 Classic Roman blinds completelycorrespond to the mechanism described above. 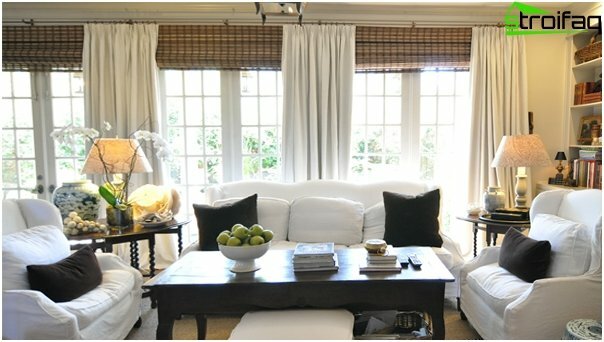 They do not have much "bloat" and "notions" - they both embody the simplicity and elegance. 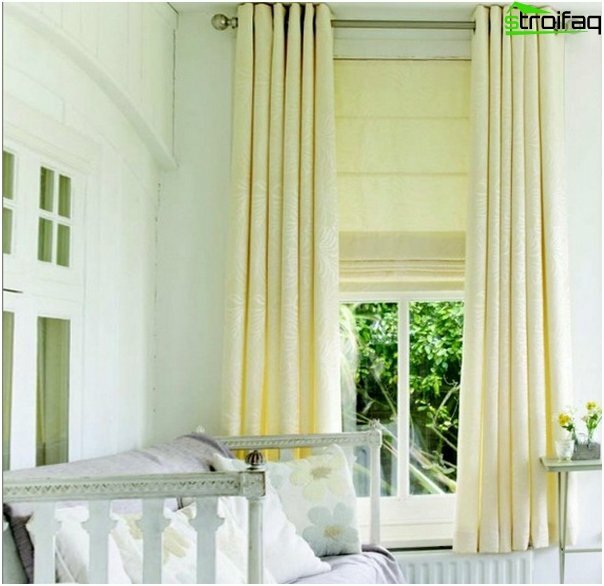 Folded curtains fall beautiful horizontal folds, and in the spread - almost perfectly straight. 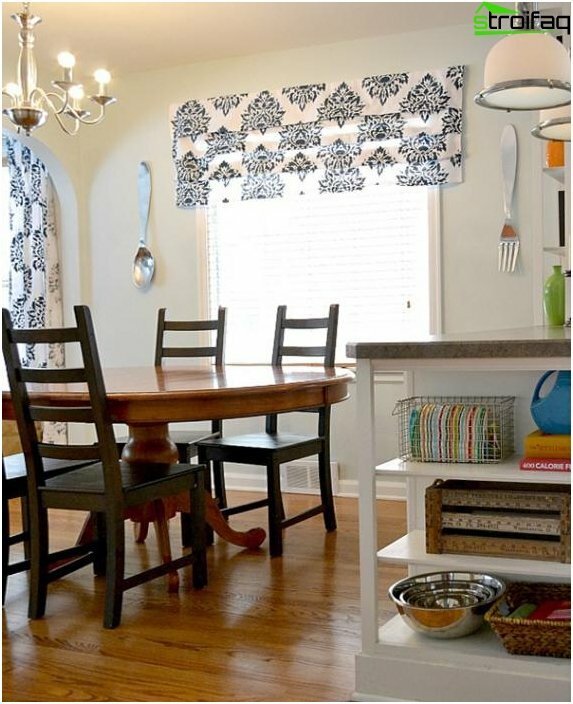 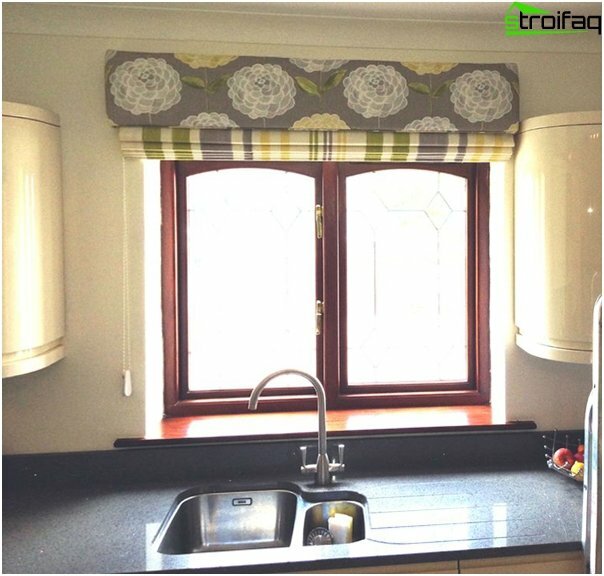 Such curtains will look great in the kitchen or in the nursery. 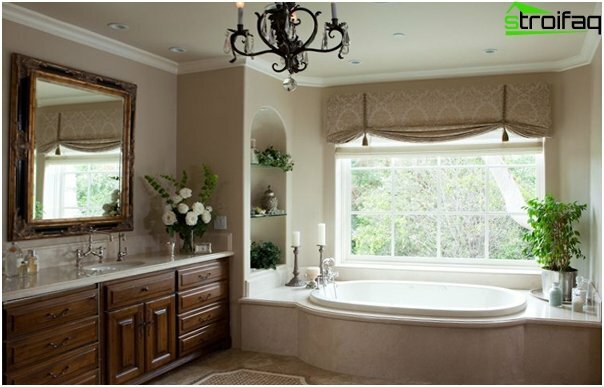 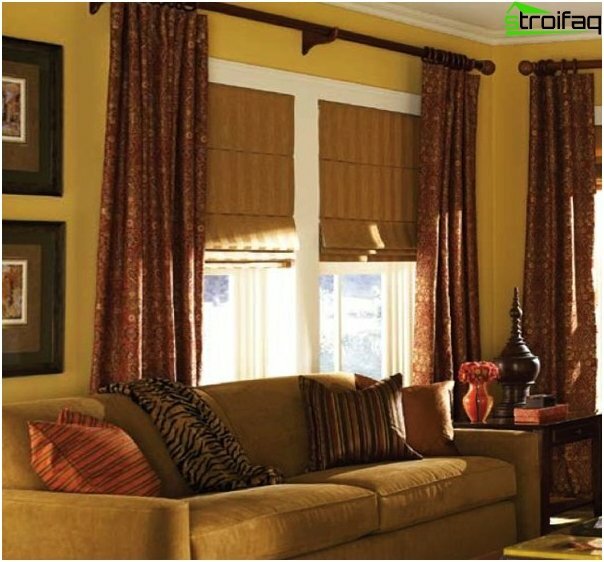 Unlike classic, such curtains formwaves and draping of fabric, even when they are completely dissolved. 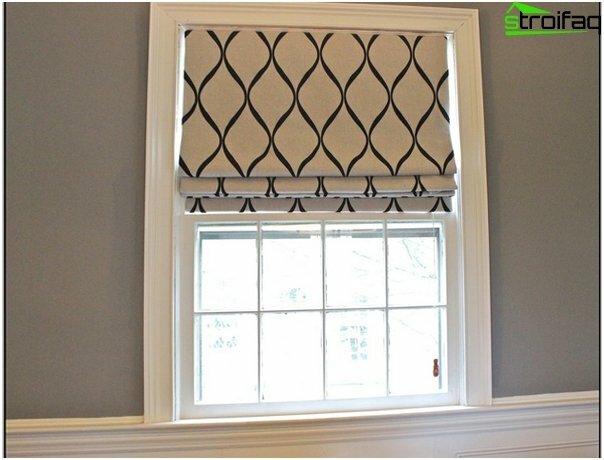 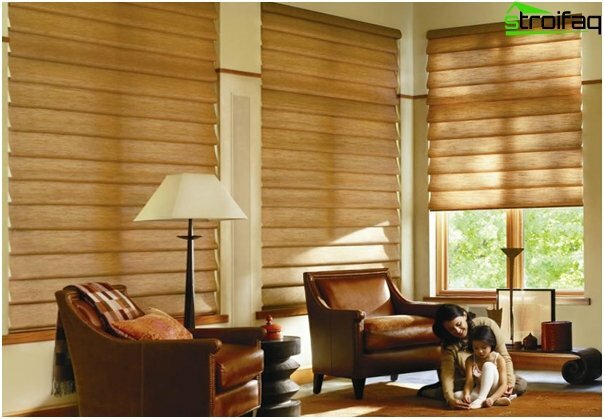 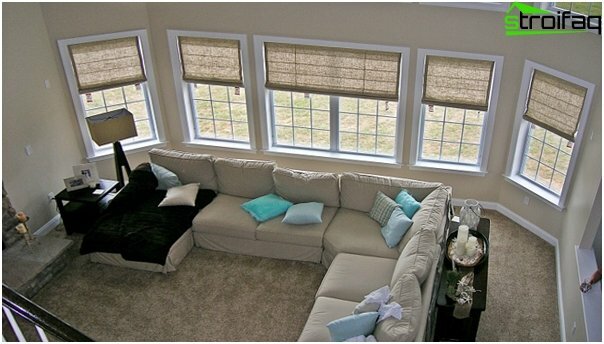 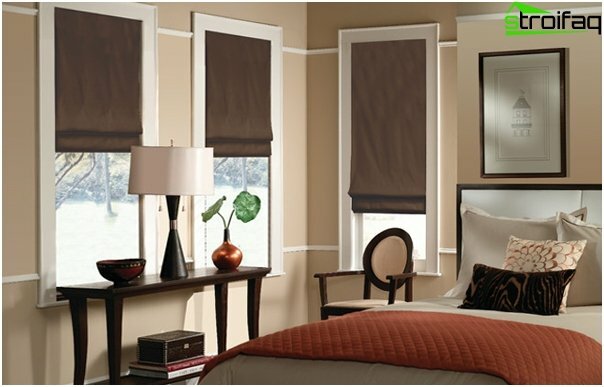 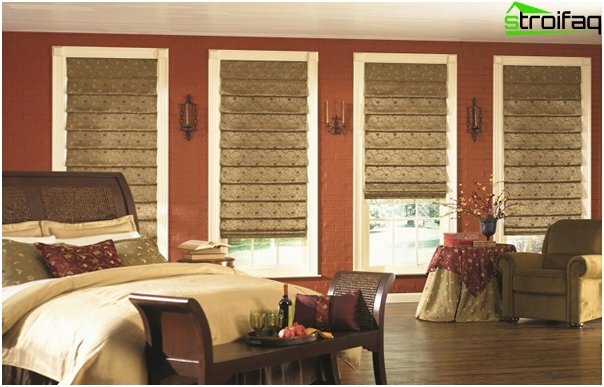 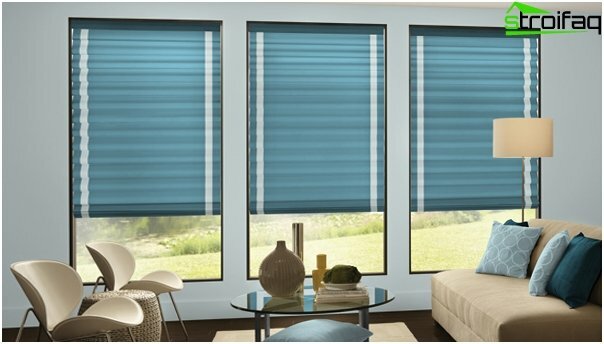 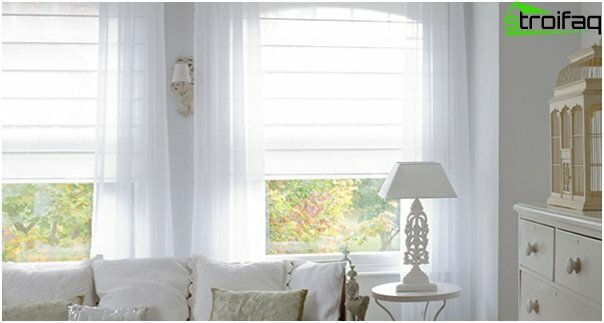 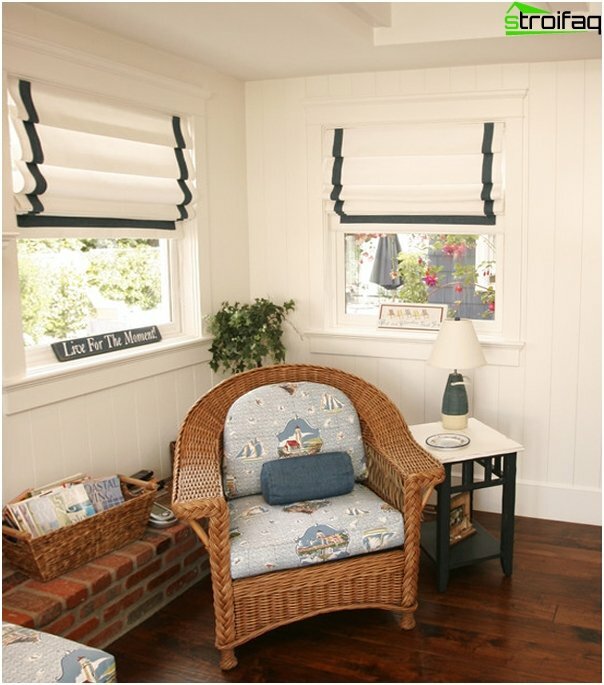 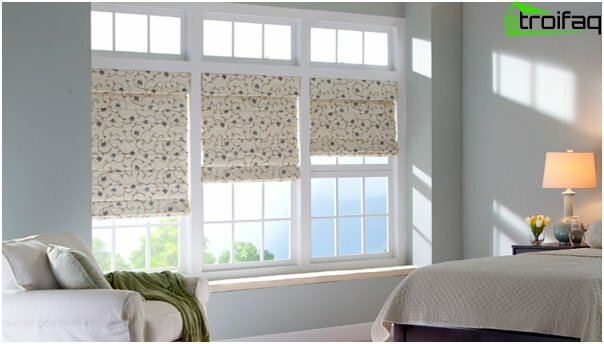 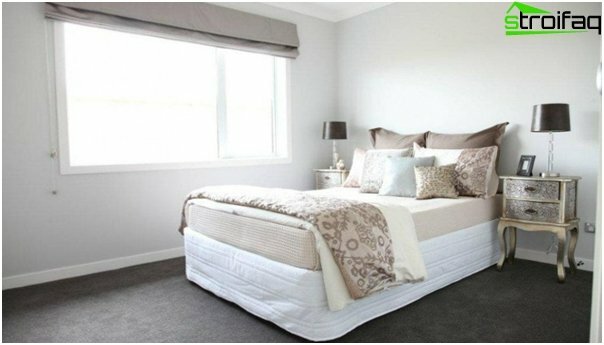 This type of blinds looks gorgeous in the living room or bedroom. 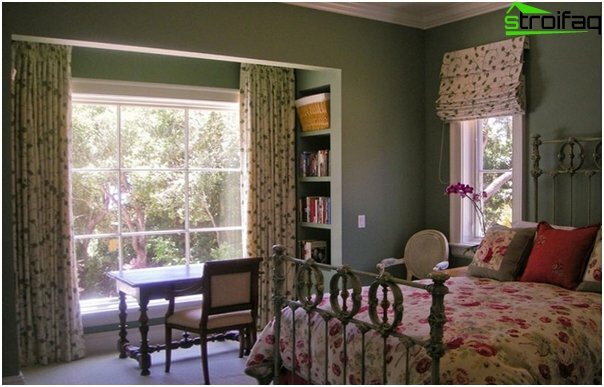 It is best to apply it in the interiors, which are made in the style of Provence, Country, Shabby-chic. 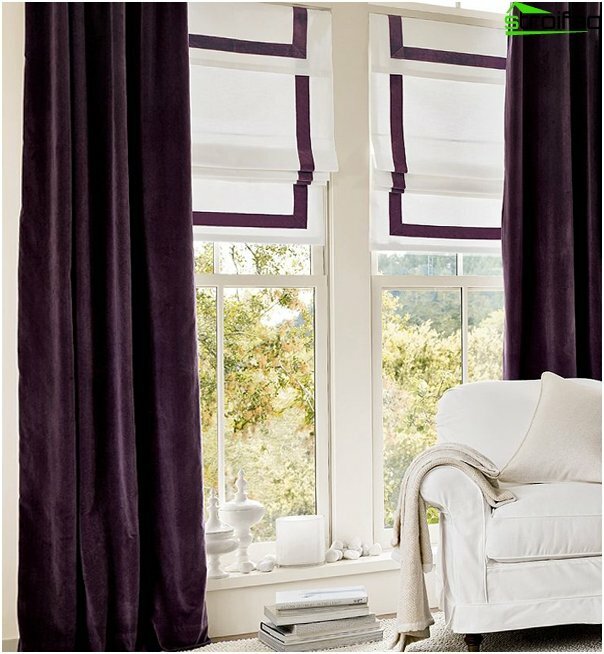 This type of curtains is the easiest, graceful, almost weightless, because there are no joints. 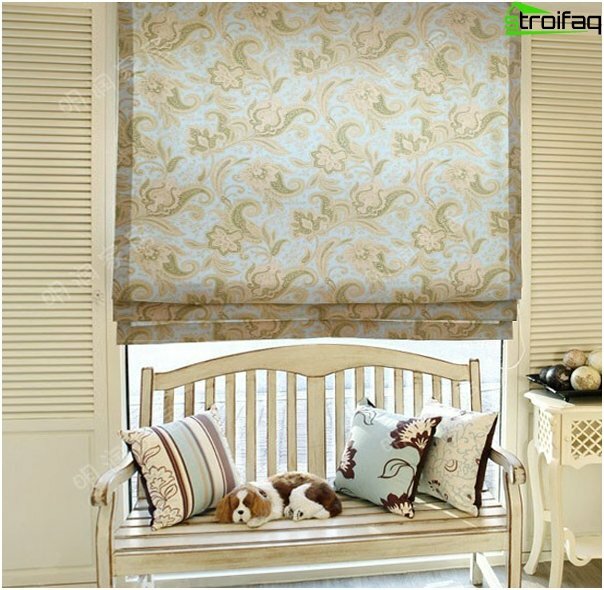 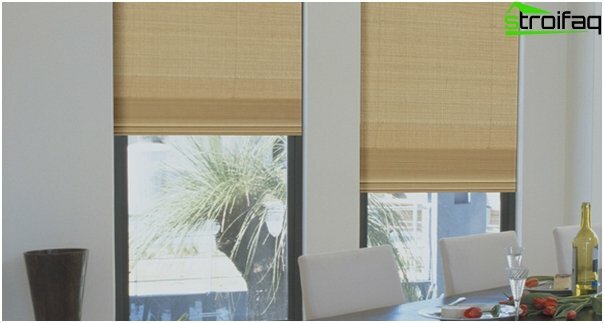 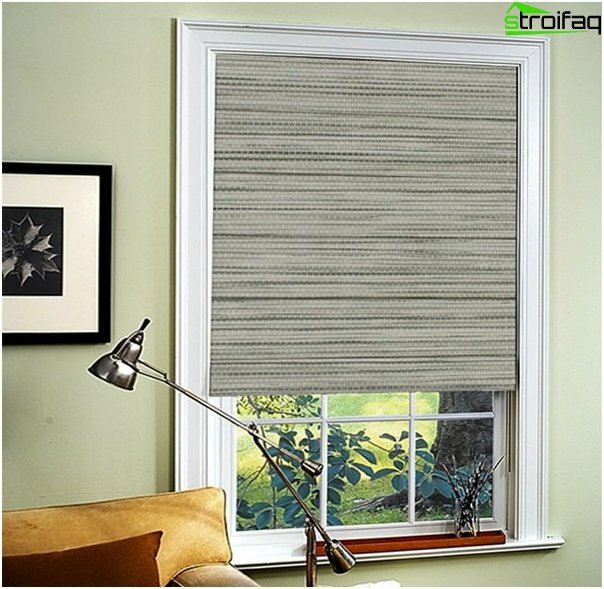 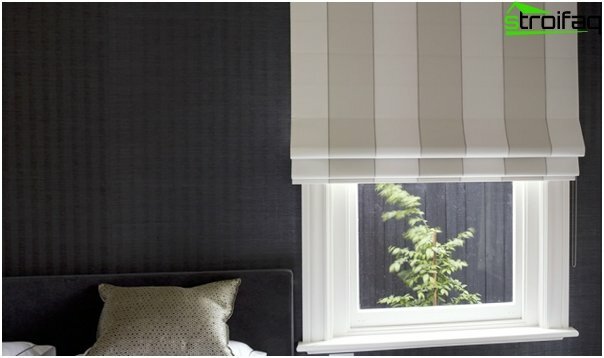 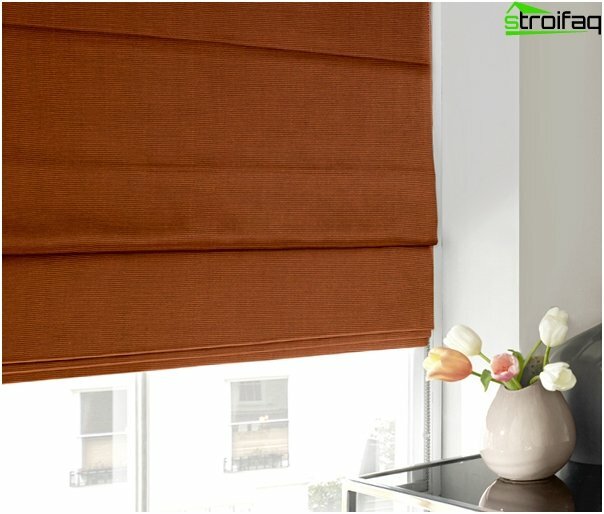 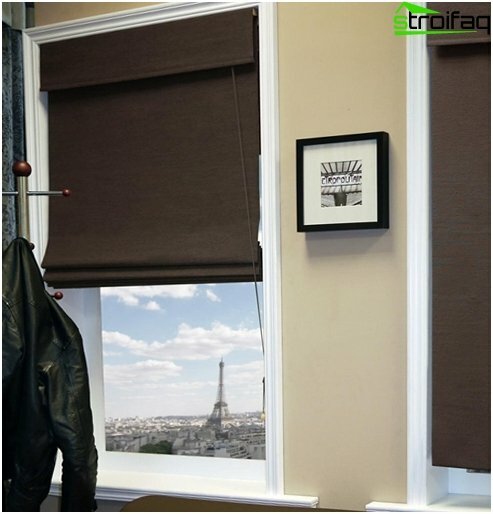 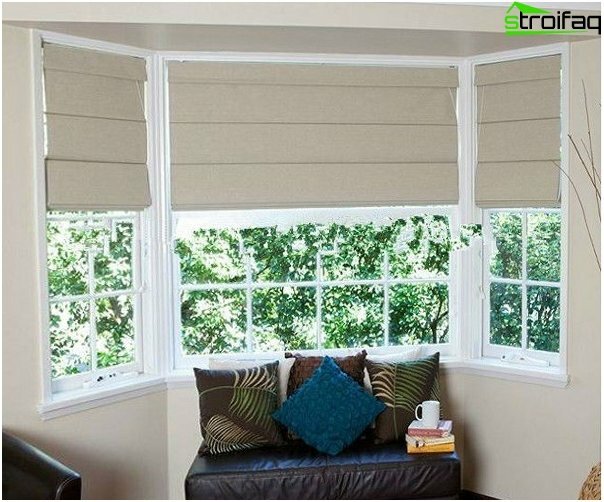 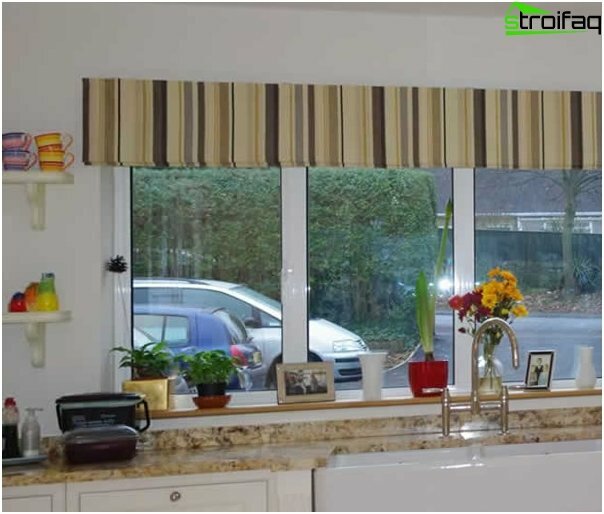 Frameless Roman blinds - a simplified kind of blinds that can easily make yourself. 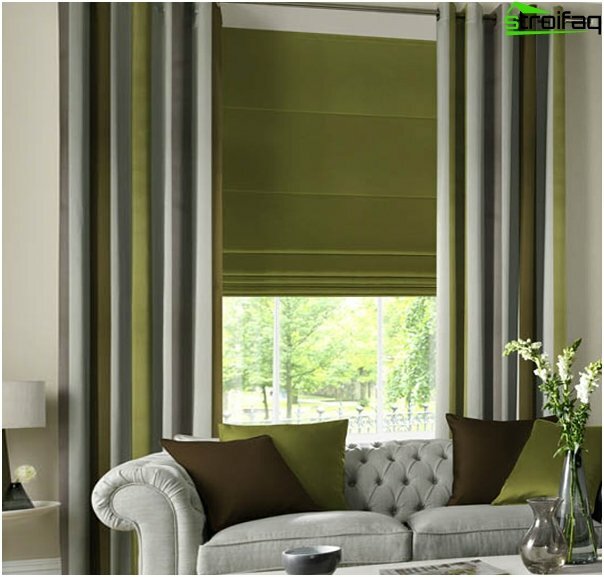 The field you have decided on the type of Romancurtains, it is necessary to pay special attention to the fabric. 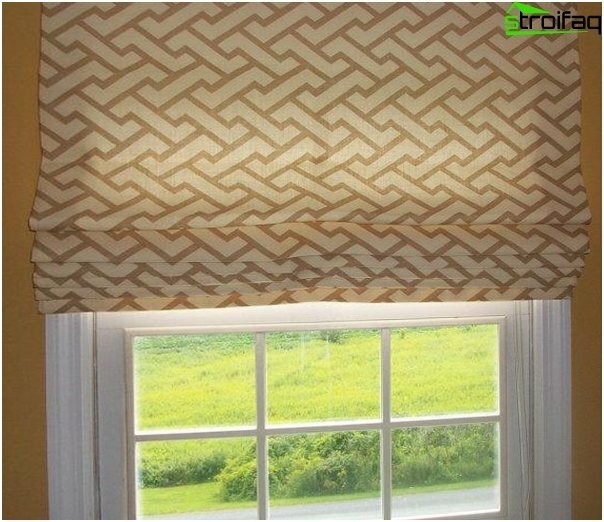 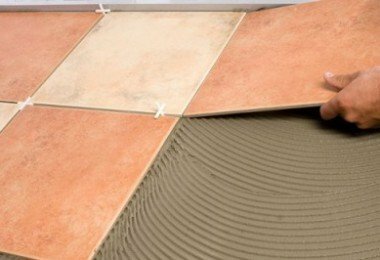 And the question here is not even in the picture, which will be most successfully combined with your Non-woven wallpaper, and in the material, because of different fabrics - different densities and different light transmission. 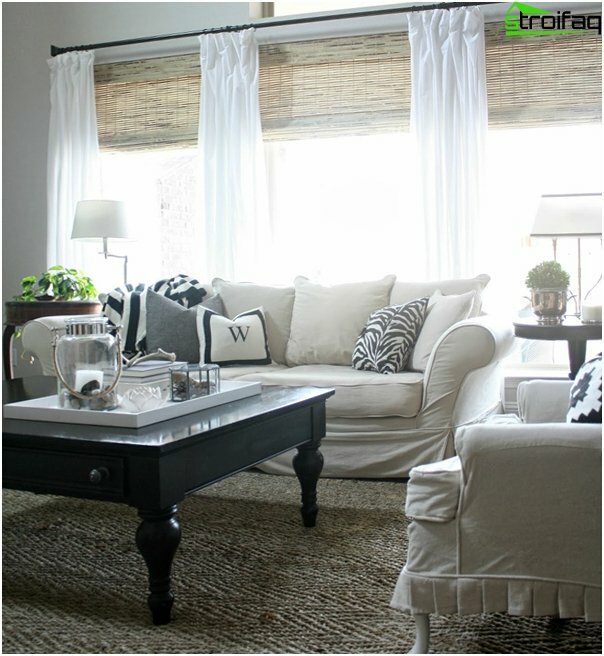 Of course, the first thing that catches your eye -it is their naturalness. 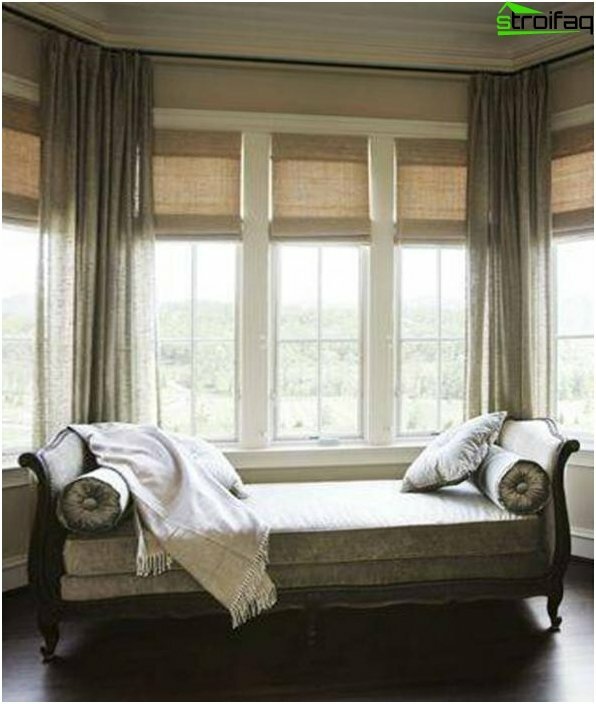 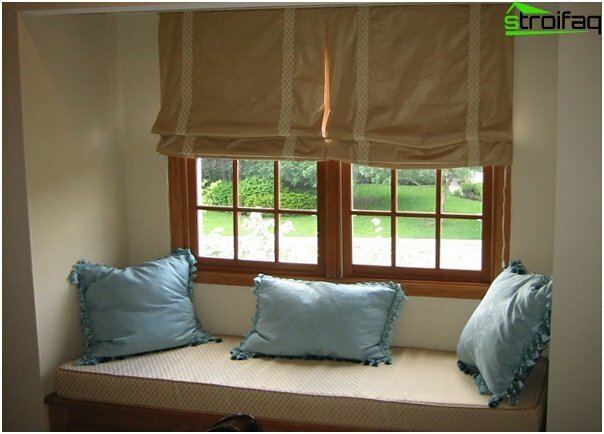 Therefore, most of the linen curtains used in such styles as country, Provence, Mediterranean, classic. 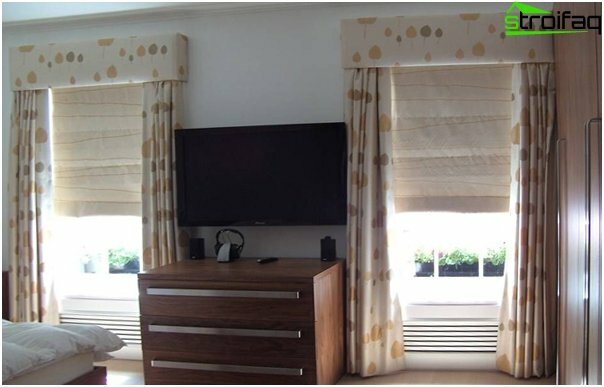 In the manufacture of linen curtains are not used printed patterns. 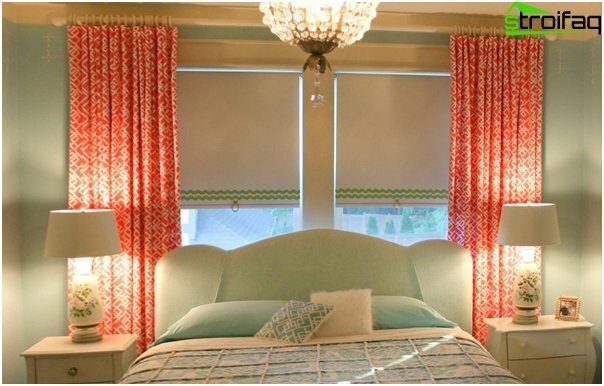 As a rule, the aesthetics of such curtains is their texture. 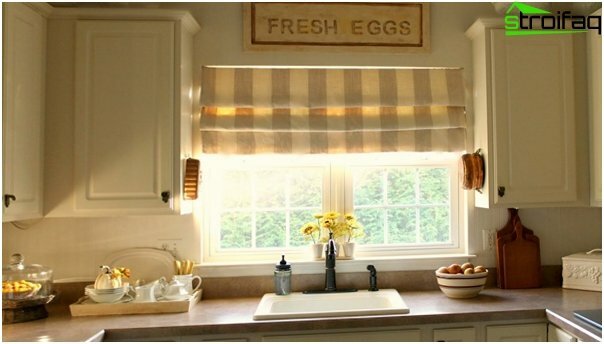 Because of its density, linen curtains have an average light transmission, so make good use of these curtains in the living room or the kitchen. 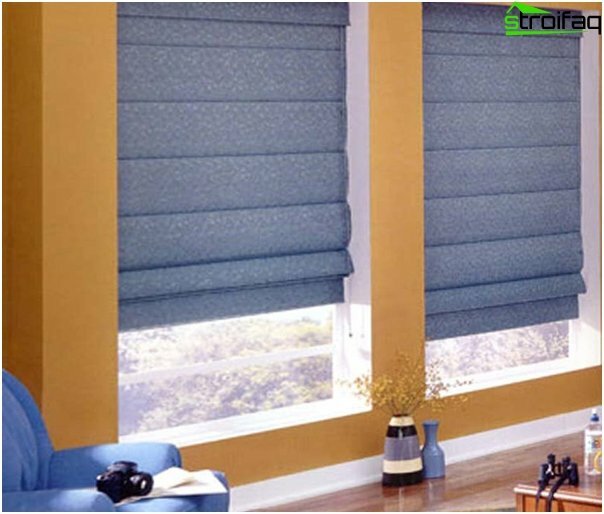 Resistance to thermal and chemical influences. 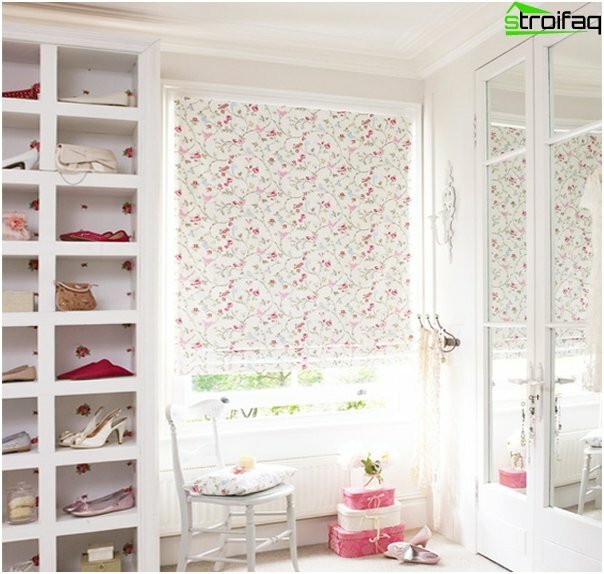 Such fabrics are appropriate for the manufacture of curtains for the kitchen and the nursery. 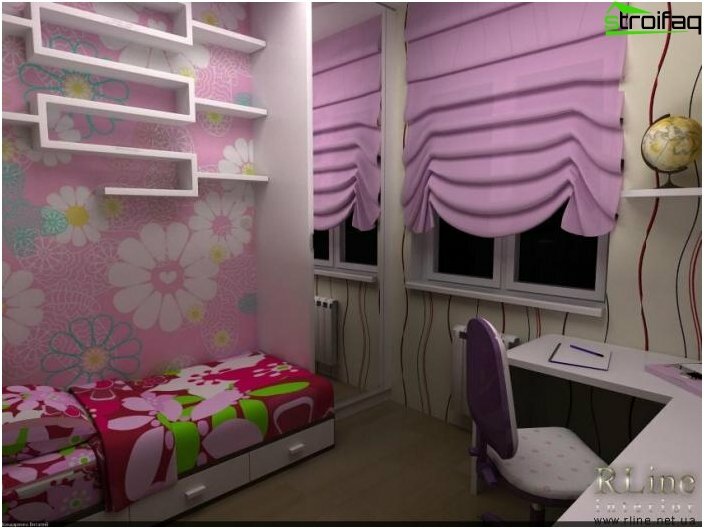 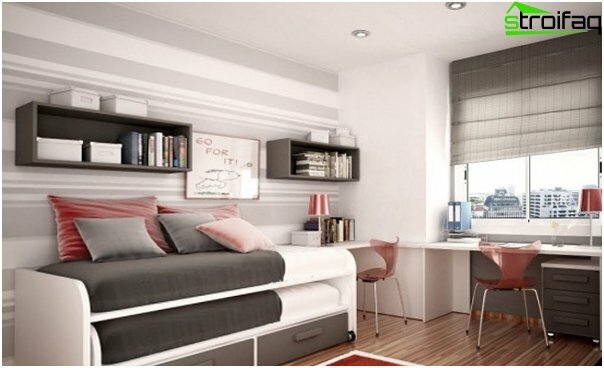 Read about the design of children's rooms for girls! 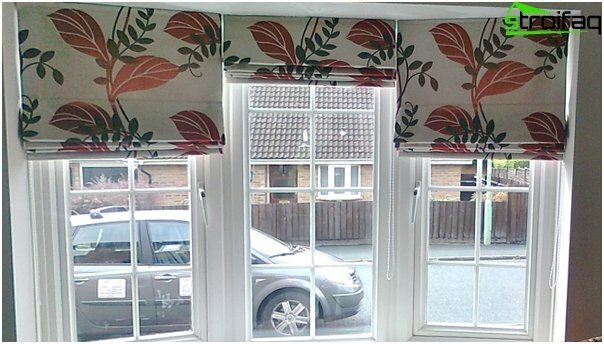 But remember that under the influence of temperature (eg, from a radiator or battery) can be deformed so blind! 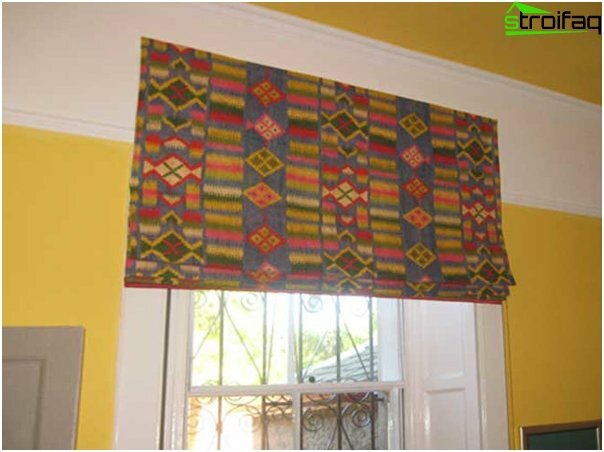 Mixed fabrics - a fabric that is created fromof different fiber properties. 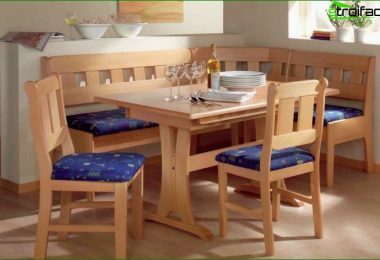 In one cloth may be used natural fibers blended fabric (e.g., cotton, silk), synthetic or artificial. 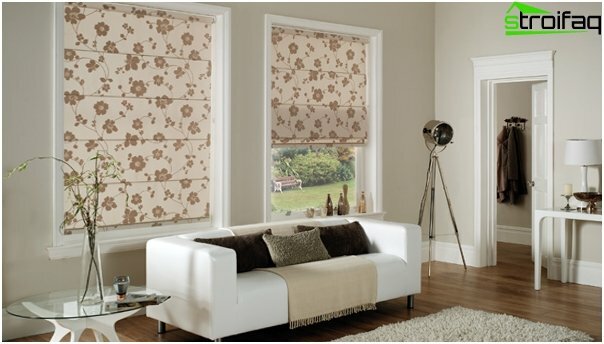 The variety of combinations creates a wide choice of fabrics, from very light and almost transparent to opaque and heavy. 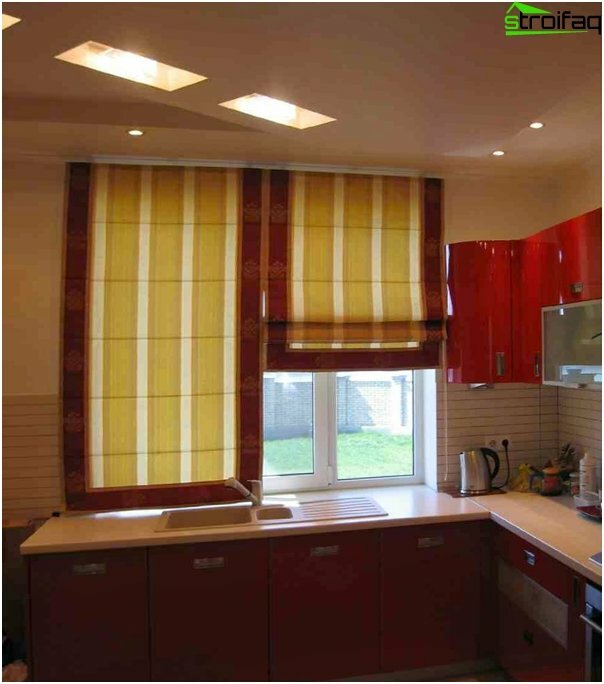 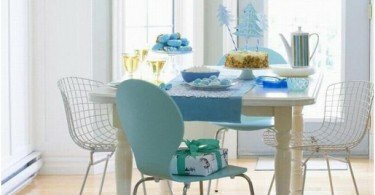 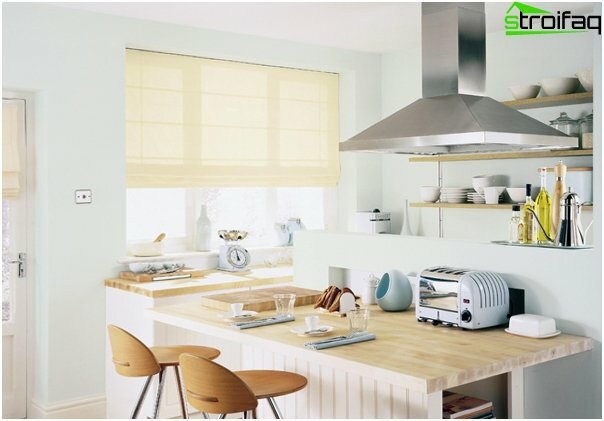 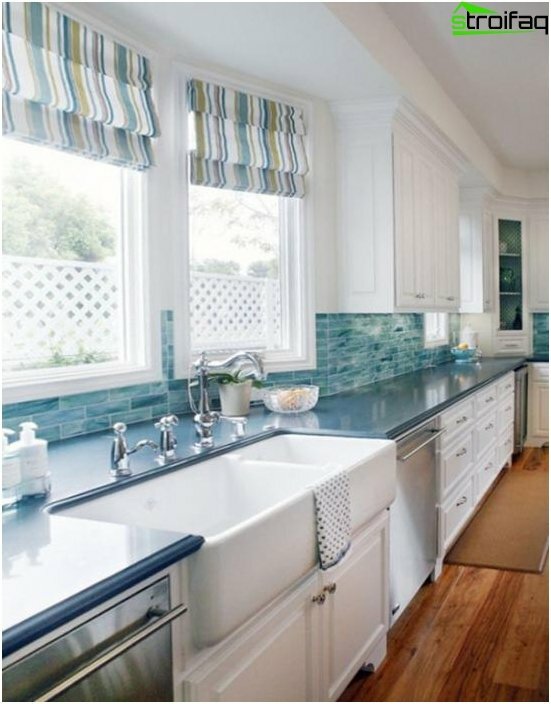 Light fabrics can be used in the kitchen, while the blended dense curtains are best used in the bedroom and child (especially if it is located on the sunny side of the house). 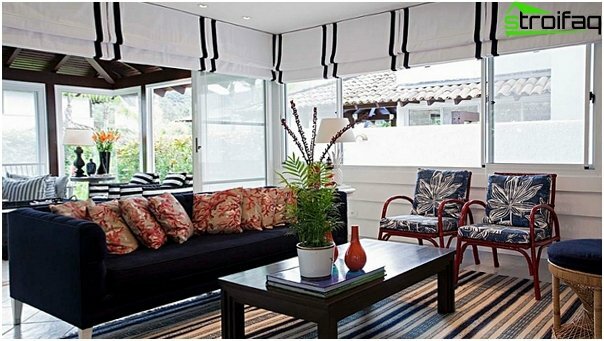 The colonial style of the premises as aitself originated in the Age of Discovery. 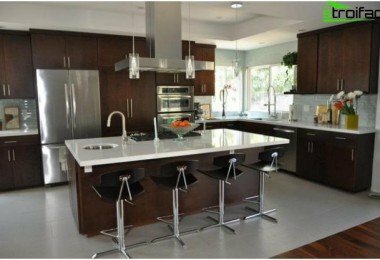 It was at this time the Europeans actively conquer the world and founded the all new and new colonies (hence, the name of the style - colonial). 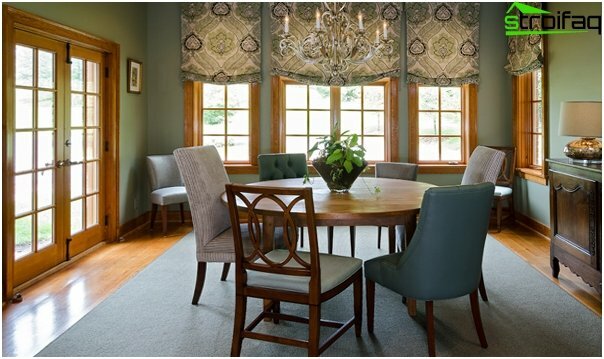 As a result of this, a classic European style interior decoration spread around the world, but began to acquire exotic features and local flavor. 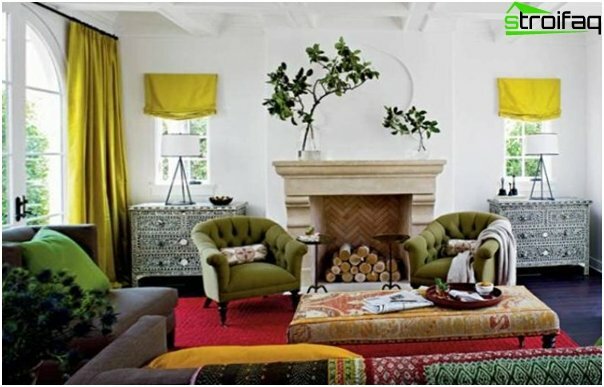 Since the main directions of research and geographical discoveries were focused on the southern and eastern lands, and the colonial style combines European and Middle Eastern or African features. 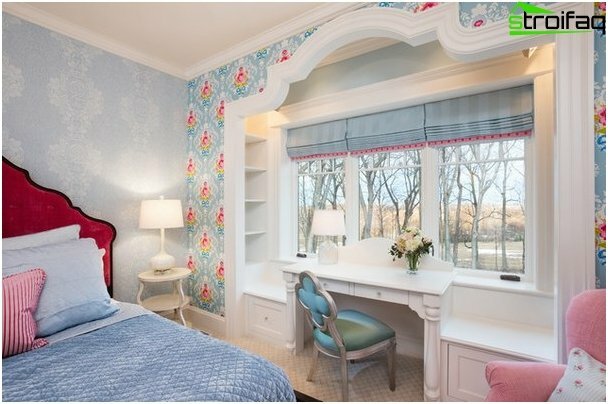 For the colonial style typical of the soft,pastel neutral colors. 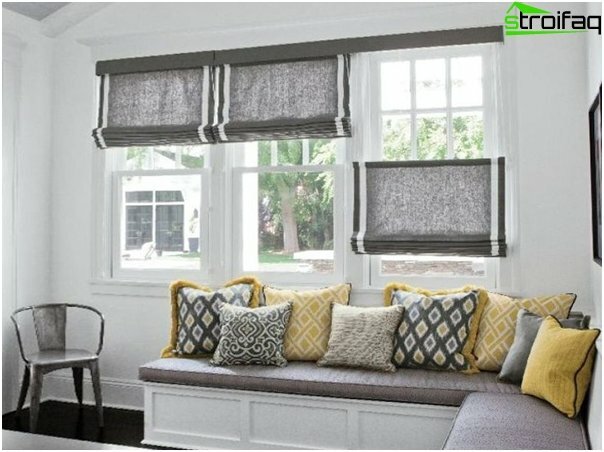 Curtains for decorating rooms in colonial style is acceptable to use only natural materials as much as possible natural colors, but you can dilute the monotony of some exotic pattern, ornament or print. 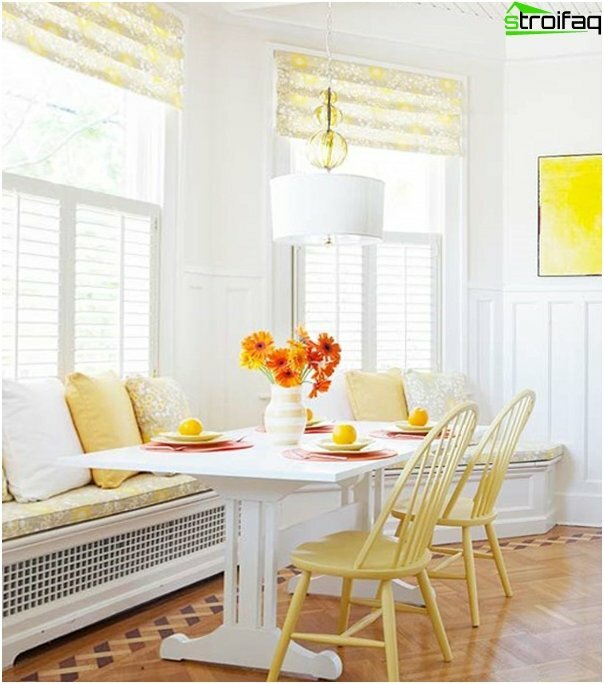 Colonial style is not tied to a particularterritory (such as Provence), but for a harmonious and consistent style is best to choose a theme and stick to it to avoid absurdity and bad taste. 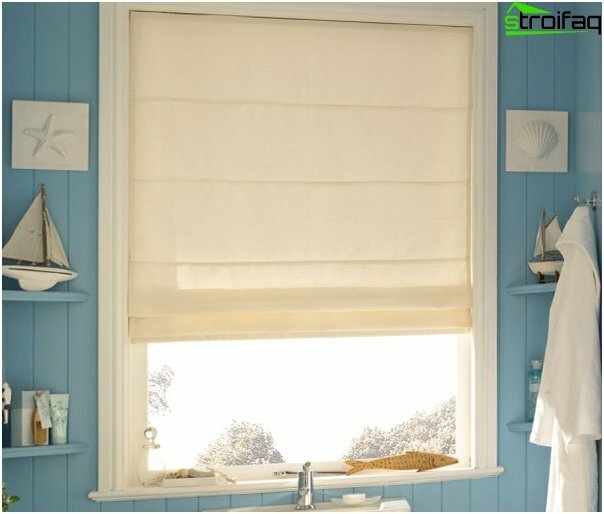 It is hard to imagine the style in which Roman blindslooked would be more appropriate than in the sea. 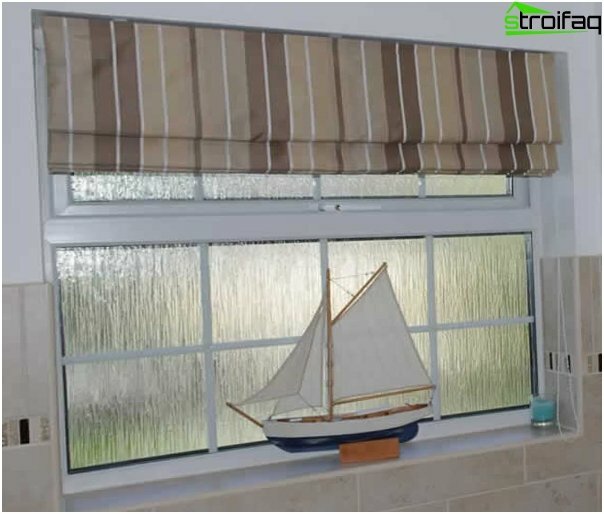 And this is not surprising, because the blinds production technology was borrowed it from sailors that by transverse cords collected and spread their sails. 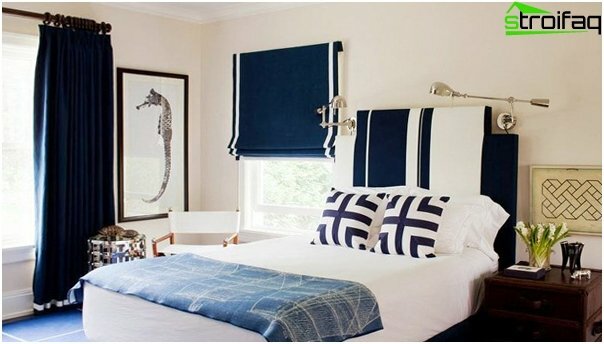 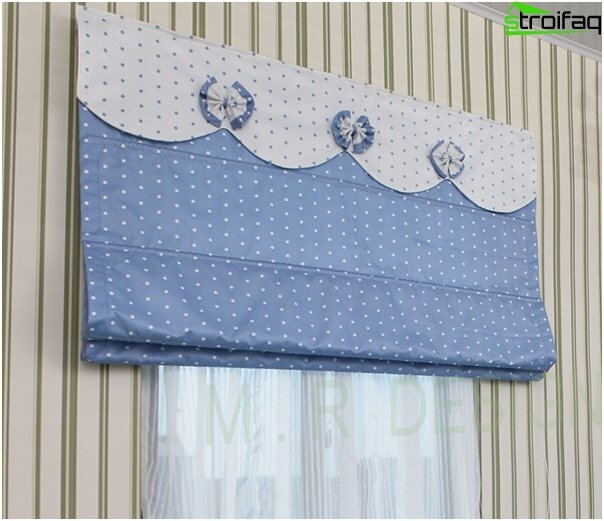 will be in a nautical style appropriate light curtains allshades of white, pale blue or dark blue. 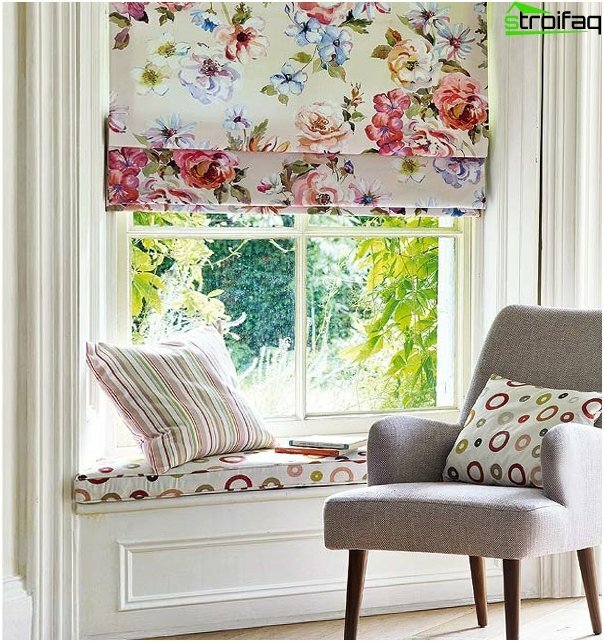 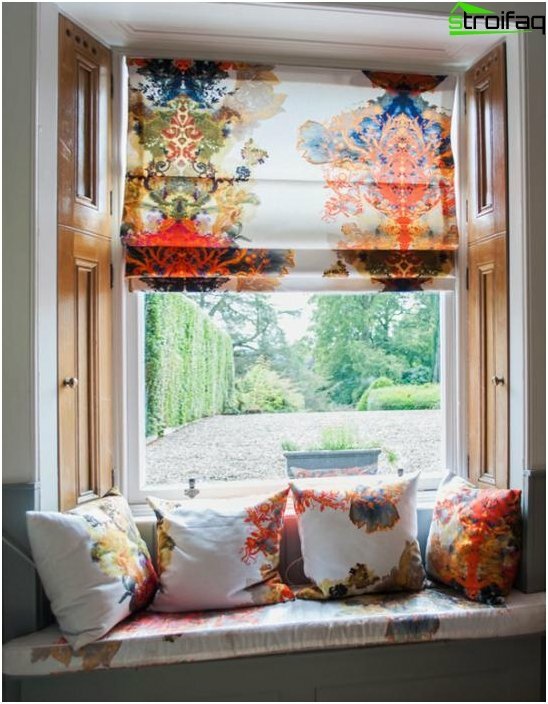 It is better to refrain from striking and eye-catching patterns, especially floral motifs. 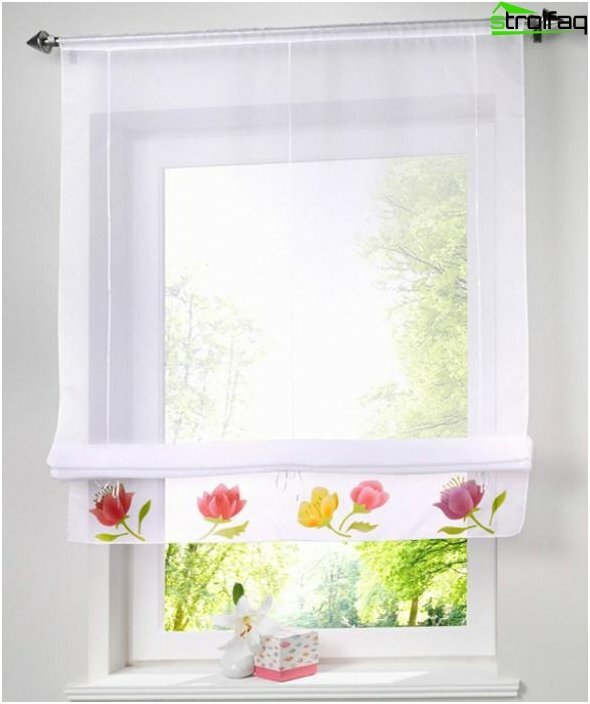 On the other hand, would be appropriate seashells image, seagulls and sailboats, strips, but they should not be screaming and causing flowers. 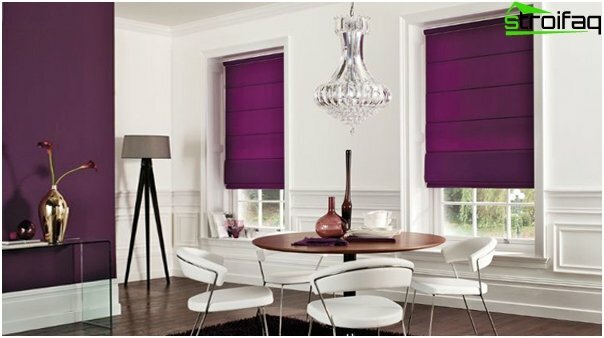 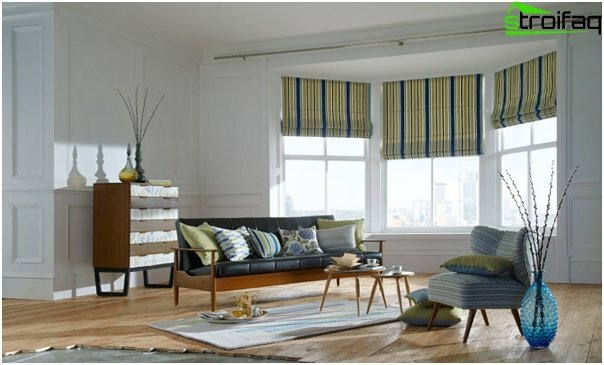 Excellent will look bright cascade roman blinds. 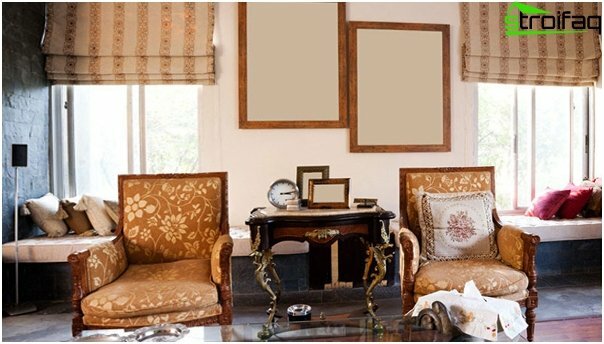 Retro style is perhaps one of the most interesting andunusual styles of interior design, as you can find these things that era: vintage figurines and boxes, antique furniture (instead of cutting-edge furniture from Ikea), antique mirrors. 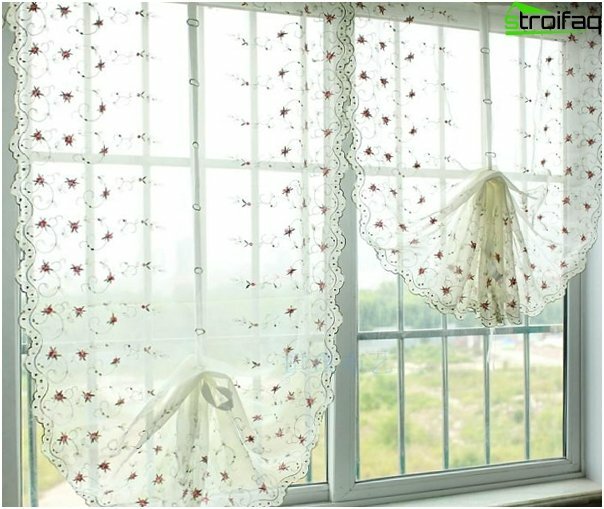 However, textiles rarely retain their original appearance, so it is unlikely that you will hang on the plastic windows grandmother's curtains. 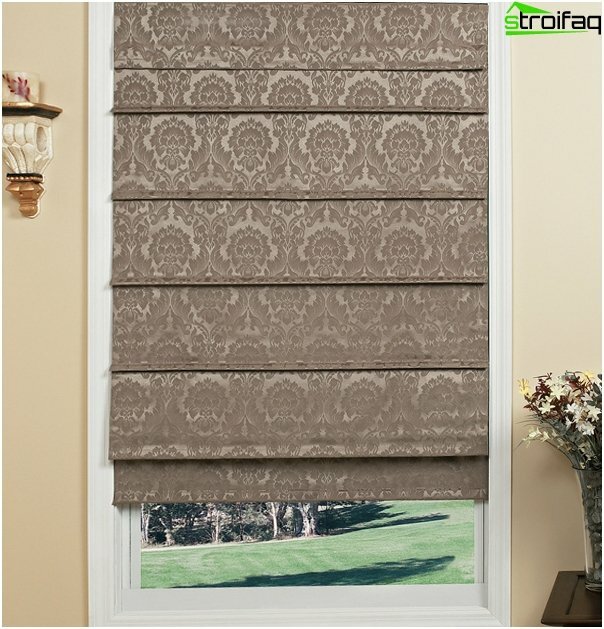 If you are going to buy roman blinds for rooms inretro style, carefully review what color fabrics are in demand in the decade under which you stilizuete its interior. 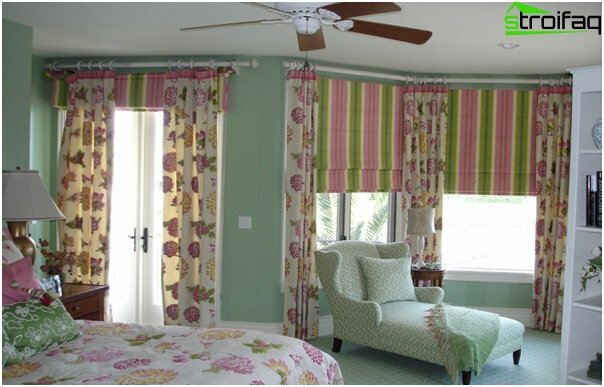 This may be striped fabric, or a cell with a floral pattern. 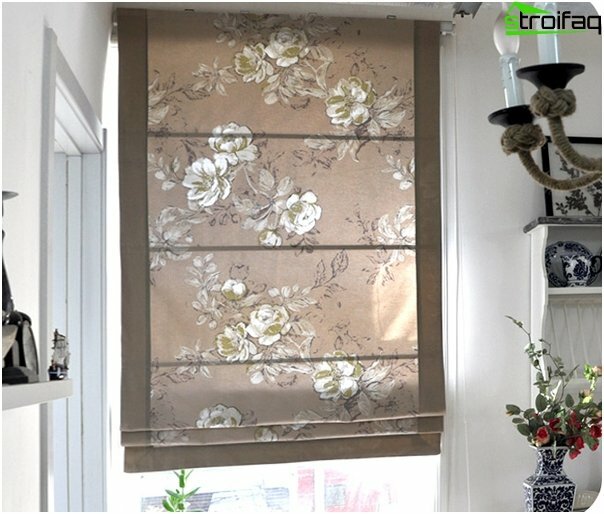 Retro - very elegant and refined style, so the rough fabric is not suitable to create curtains. 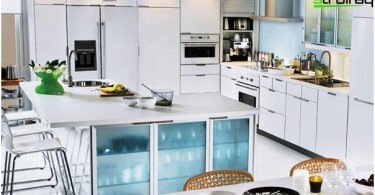 As well as not relevant to the use of flashy neon colors. 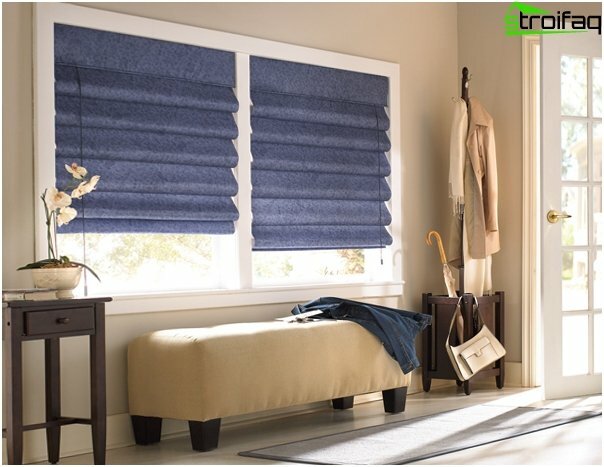 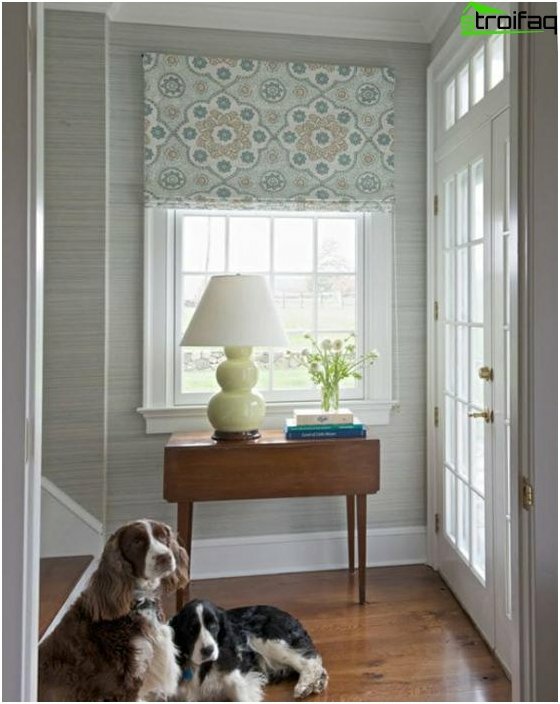 Despite the fact that textilesYour room in a minimalist style, used very little, Roman blinds classic type will perfectly fit in this style, because they are devoid of unnecessary details, ruff, ruffles and drapes. 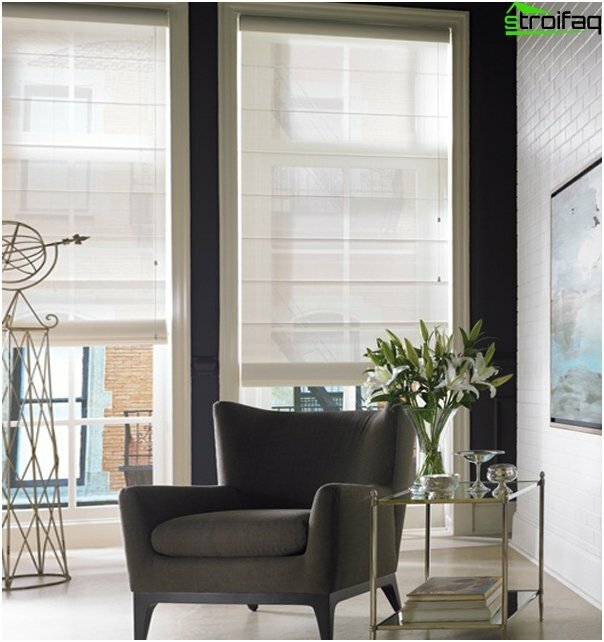 It is appropriate to use a monochromatic fabric or cloth into a strict strip. 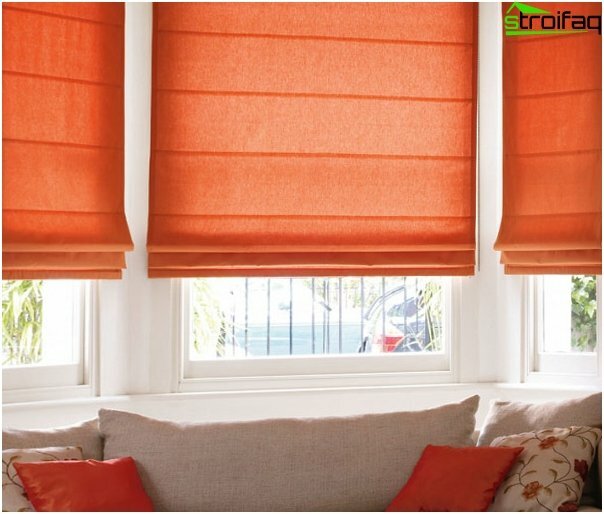 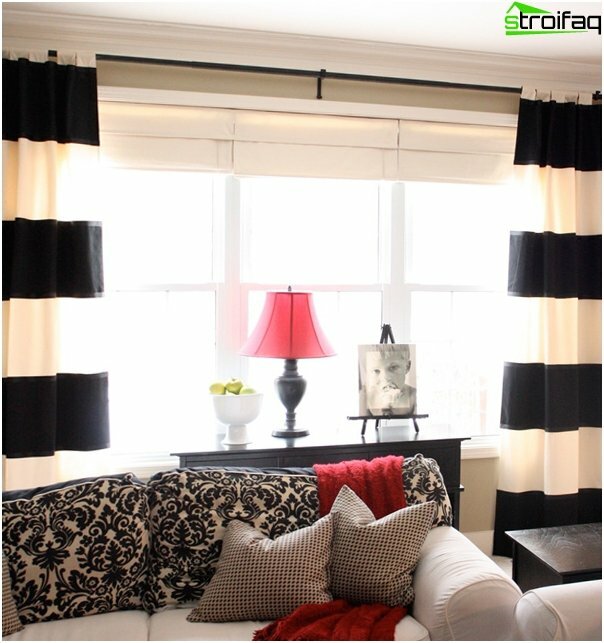 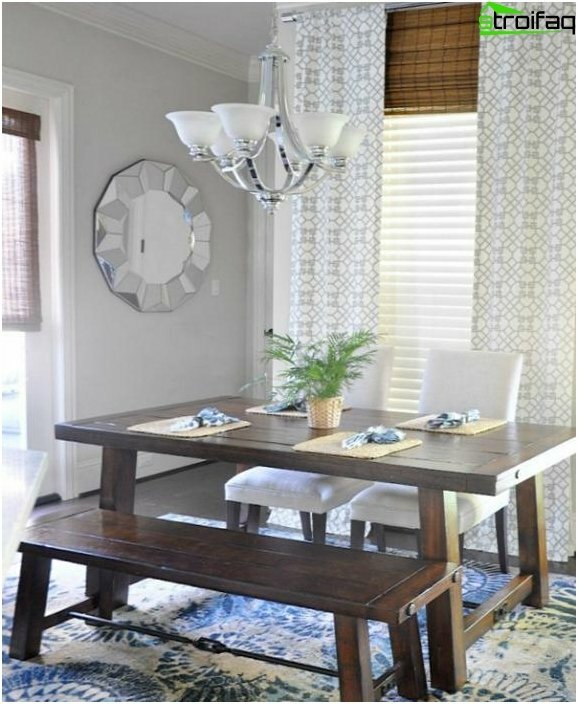 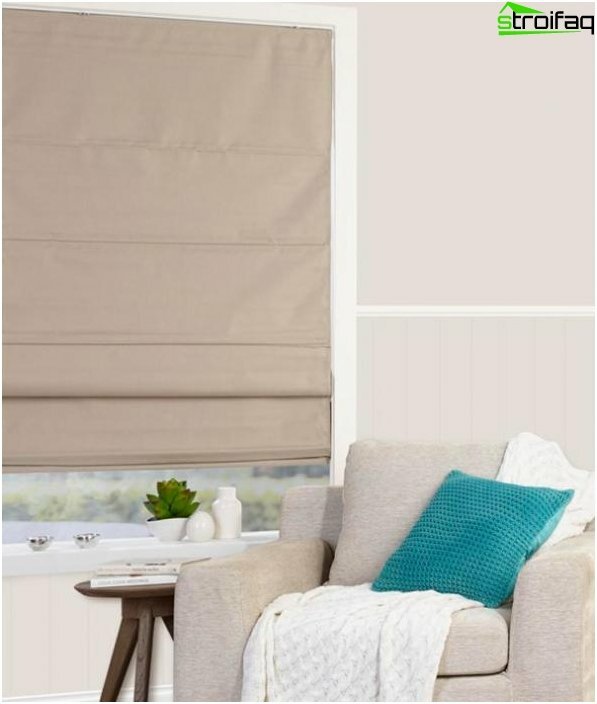 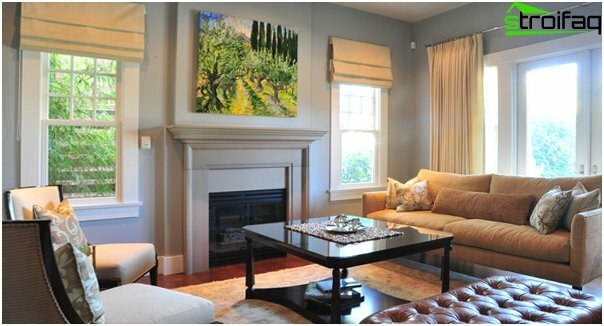 Roman blinds for the living room can be used as a separate element of the decor, and in combination with traditional curtains (in this case will serve as curtains blinds). 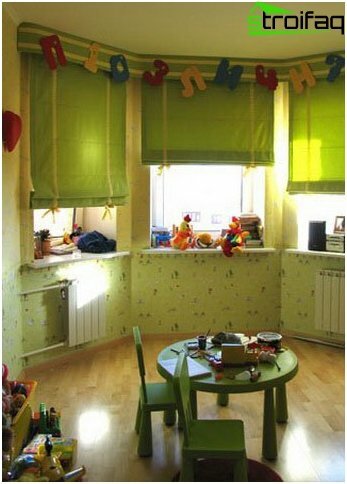 For the children's best to use roman blindsbright colors, but it must be very thick, so nothing could disrupt sleep baby (and day and night). 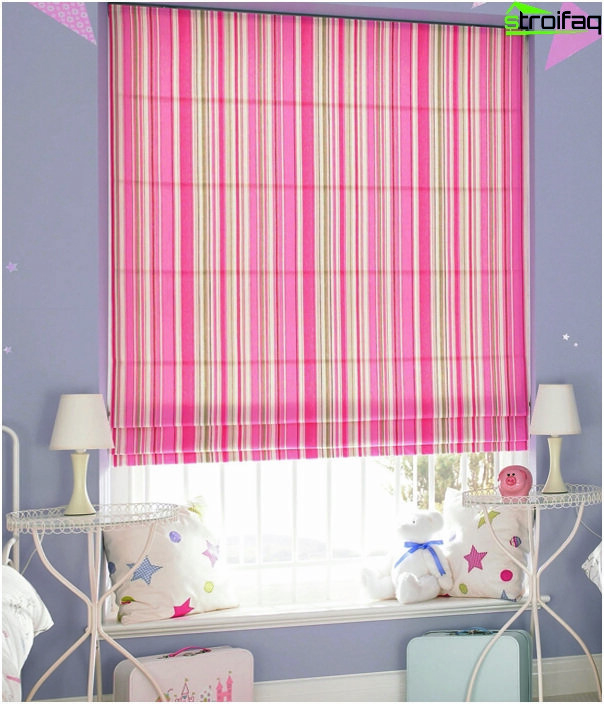 Easy to use in children's synthetic fabrics. 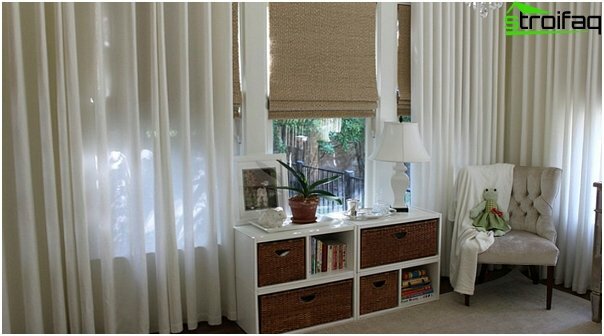 Be sure to read about how to set up the nursery for two children! 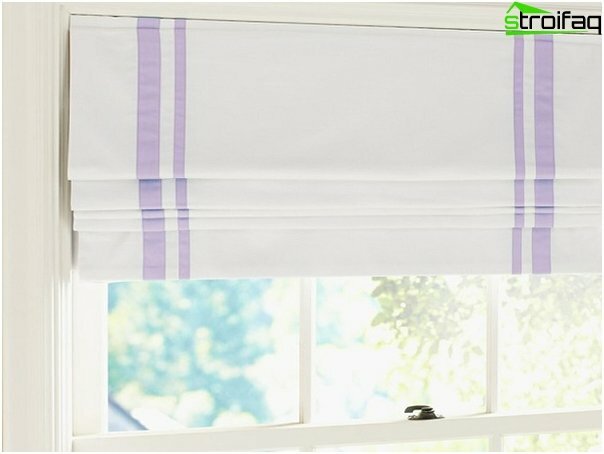 Also, as for the child, the curtains in the bedroom should be dense. 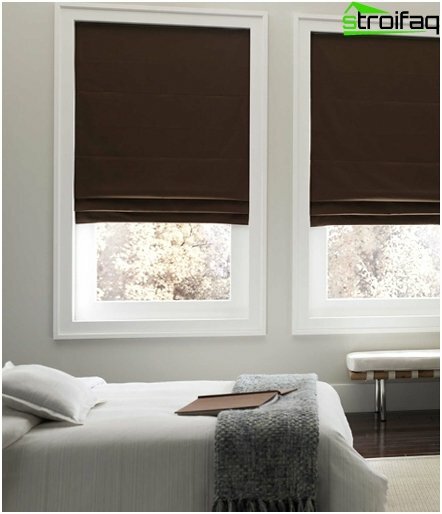 This will help keep the full sleep and create all the conditions for relaxation after a hard day's work. 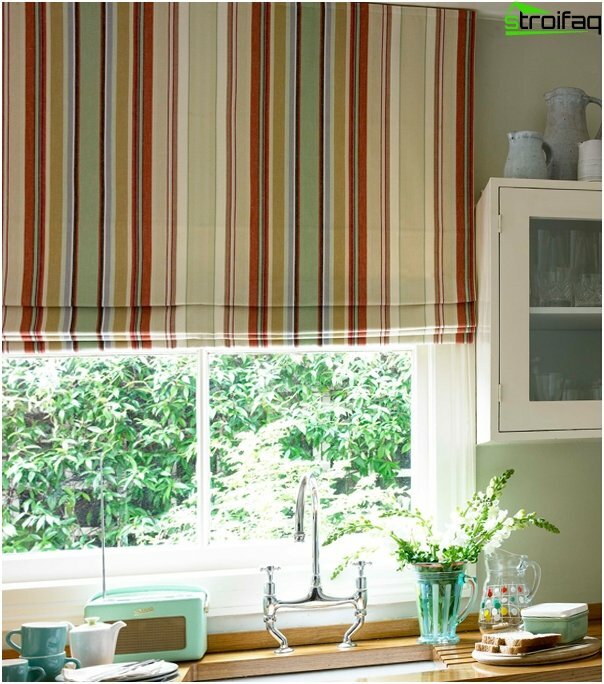 In summer, on the south side, especially during cooking, the kitchen is unreal hot, so in this case, blinds better to use thick. 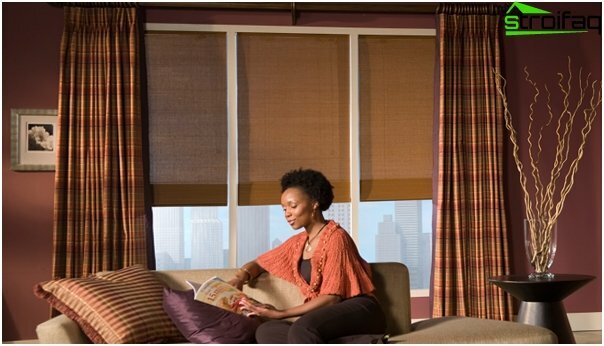 In all other cases, we can restrict light and weightless curtains. 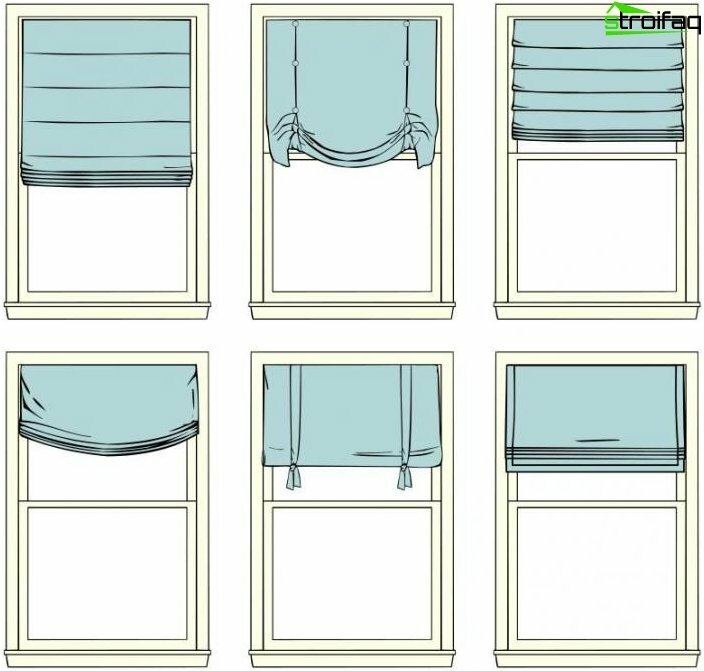 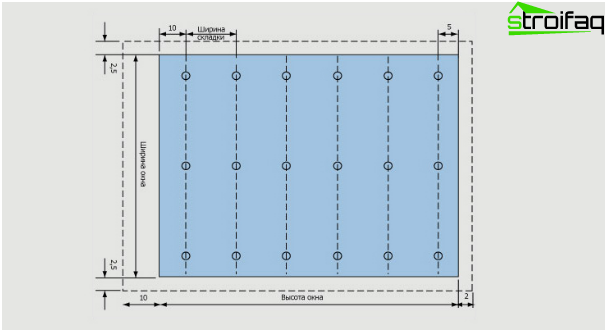 Calculate the fabric consumption: the size of the window opening + 15-20 cm in height + 5 cm on each side. 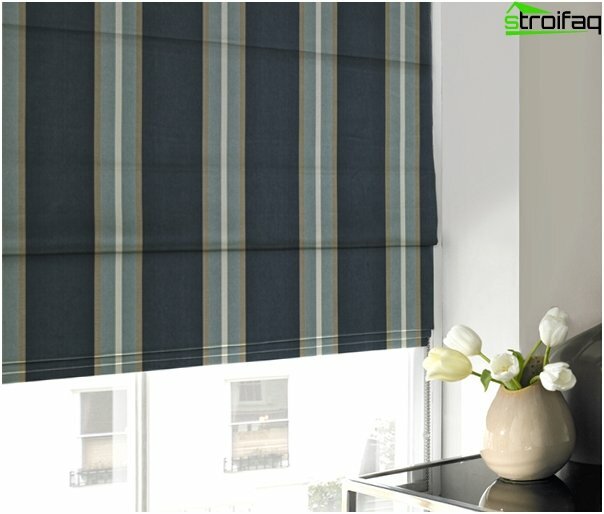 Decide on the choice of fabric: dense, transparent, light, heavy, etc. 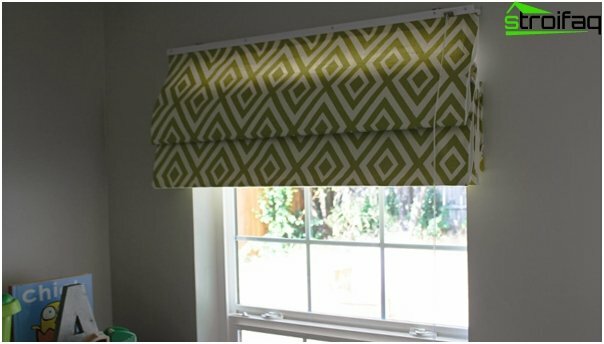 On the reverse side of the fabric, at the same distance from each other, apply a layout placing the rods and rings to the cord. 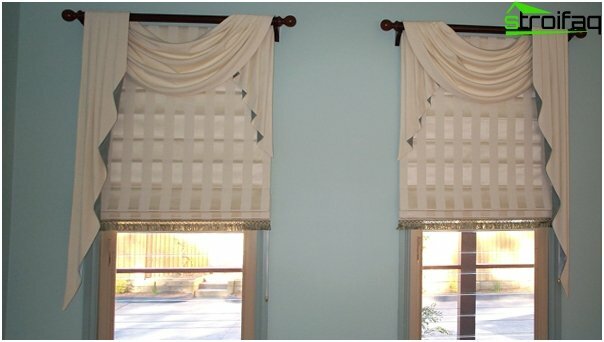 At the top and bottom of the curtains do podvorot Velcro so that he wore on the ledge (top) and to increase the weight of the bar (bottom). 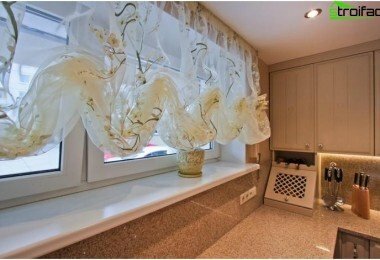 Then you can freely remove the curtains for washing. 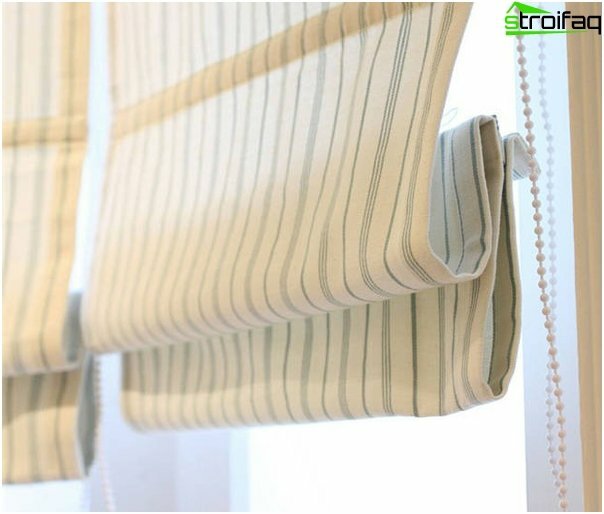 Baste the backing fabric to the back of the curtainhand, prostrochite around markup rods so that the seams formed between the trough into which you can insert a pin (metal or wooden slats can be purchased at the online store Leroy Merlin). 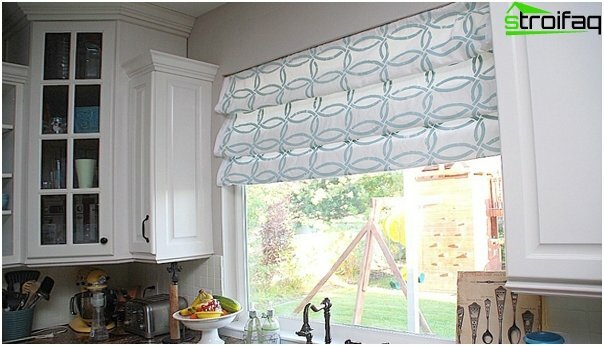 Sew hand ring, thread the cable through it (vertically). 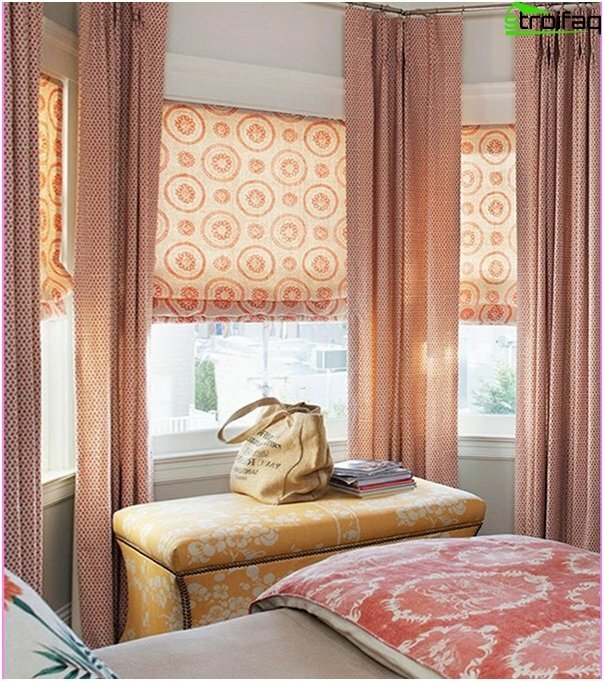 Your curtain is ready! 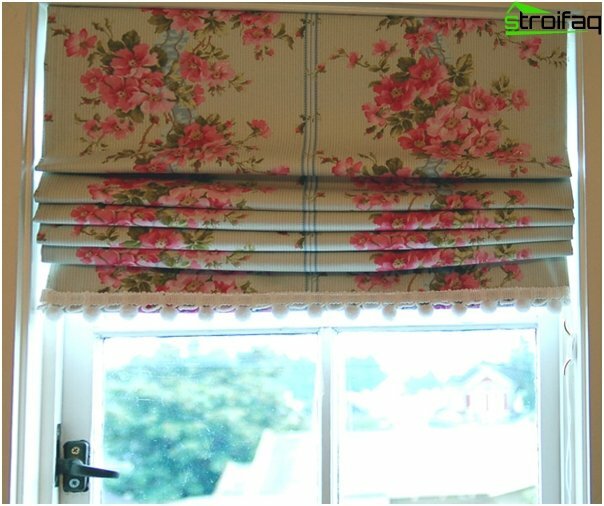 To hang roman blinds without drilling, attach it to the window casement.